When friends at a party start talking politics, you ____. Dive right in with my opinion. Listen and interject with the occasional thought. Participate, but more as a mediator than someone with a strong opinion. As a traveler, you’re mostly on the hunt for ____. Which mode of transportation do you most prefer? Sitting in the back of a limo. Pick your favorite sandwich from the following. If you could take one of the following items with you on an indefinite camping trip, you would choose _____. 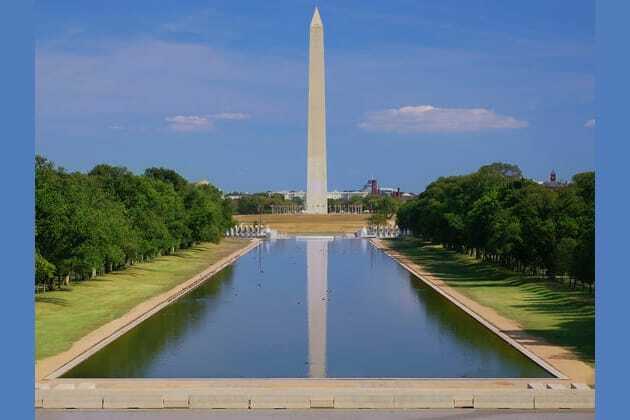 Tall and grand, the Washington Monument is a favorite destination. You enjoy the authority that comes with height. Rather than getting bogged down with little sights, you'd prefer to visit the top of the monument and take in the city all at once. You believe in government and the majesty that comes with being in the home of our many presidents. From architecture to history to the intangible buzz that comes from such a hotbed of commerce and life, the White House has all you want in visiting a national landmark. History and Washington, DC are lovely, but you are more of an atmospherically inspired individual. The Jefferson Memorial waxes romantic with its pristine setting across the shimmering Tidal Basin lined by cherry blossom trees. You could spend some time with Thomas resting aside from the hooplah down the main stretch of the National Mall. You enjoy prestige, but prefer to do so from afar. The Washington Monument may have the grandest view of DC, but you have the best. Perched up on your chair with inspirational quotes and your own pool, you and Honest Abe roll in style and comfort. You’re less enthralled by buildings and monuments than by culture and creation. As the Smithsonian, you’re in tune to all pockets of celebrated American culture from science to space to art and beyond. People come to Washington, DC for culture, history and to peruse the city's large collection of national monuments and memorials. Feeling torn in every direction? Find the site you need to visit by discovering what national landmark you are!